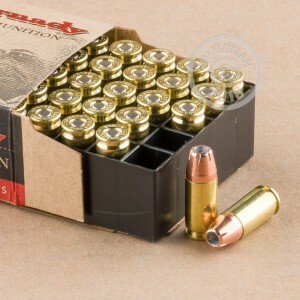 This subsonic 9mm Luger ammunition from Hornady fires a heavy 147 grain XTP jacketed hollow point bullet at 975 feet per second. The XTP's ability to penetrate assailants helps resolve self-defensive situations quickly and decisively by producing expansion in critical areas and causing quick incapacitation. This ammo is best used in full-size handguns like the Glock 17. The full size barrel insures that the bullet will reach its highest velocity, which will improve terminal performance. A full size frame will also help to reduce the recoil of the heavy 147 grain bullet. But, if you don't have a full-size handgun, don't worry, because this round will be excellent in smaller 9mm handguns as well. 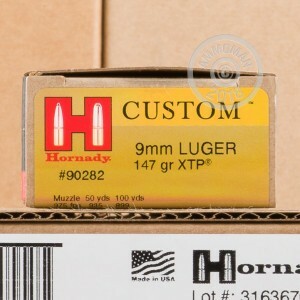 Hornady products are loaded in Grand Island, Nebraska using non-corrosive Boxer primers and brass cases. 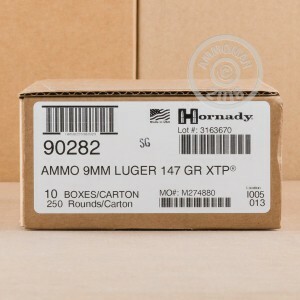 Like many other Hornady defensive loads, this ammo comes in boxes of 25, with 10 boxes per case.